Bible Lesson , a photo by CVNSac on Flickr. Almost two years ago, Assistant Pastor John Goover at Jubliare Evangelical Ministries in Natomas, was listening to a radio program about service, and was inspired to contact CVN about collaboration opportunities. After meeting with Dan Meyerpeter and Scott Thurmond, they targeted the Willow Glen Apartments on the corner of Del Paso Road and Richter Road as a good location to launch a monthly children’s out-reach. With a core group of eight to ten people, and others from the church who support the out-reach financially, the fellowship at Jubliare are faithfully sharing God’s love with not only the children who live at Willow Glen, but also their families. 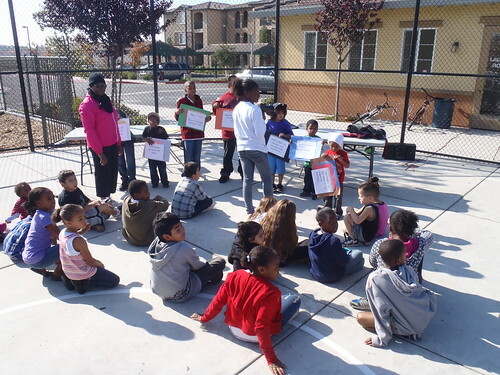 This outreach is not only making an impact on the community at Willow Glen, but also at Jubliare. But the outreach has not just reached children and their families. During one of the outreaches, a group of people went door to door, inviting people down to join them at the basketball court and picnic area. They encountered a young man in his early 30’s who just moved into the complex. He joined them and shared a meal with the group of people who had assembled there. Because of the knock on his door, and his willingness to join them, relationships were formed and a life was changed. What seems to just about children, has proven to be so much more. A children’s outreach at an apartment community is just one way a church can partner with CVN to show God’s love to their community. The group from Jubliare keeps it simple. A craft, fun, games, fellowship, a Bible lesson and a meal on a Saturday morning. This once a month offering has become a blessing to not only a community but to the church as well. CVN currently partners with 30 churches in Children’s Outreach, Homeless Outreach and Convalescent Outreach opportunities as well as Food Distribution. In supporting these churches in their efforts to bring God’s love to their community, we are planting seeds that will grow to be blessing to their communities.